If you love breakfast burritos, you’ll LOVE breakfast tacos! 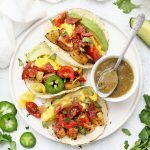 These tasty breakfast tacos are made from crispy seasoned potatoes, scrambled eggs, and all your favorite goodies. Note: Nutrition facts include seasoned potatoes, scrambled eggs, and 2 corn tortillas per person. All additional toppings are not included. In a large bowl, stir together diced potatoes, garlic powder, onion powder, chili powder, cumin, salt, pepper, and olive oil. Stir to coat well. While the potatoes are cooking, you can cook scrambled eggs and bacon or sausage (if using), and prepare any toppings. Set out salsa, minced cilantro, diced tomatoes, sliced avocado, black beans, etc. Assemble tacos by layering a small amount of cooked potatoes and scrambled eggs in a corn tortilla. Top with your favorite toppings, such as cooked & crumbled bacon, sliced avocado, pico de gallo, salsa, cilantro, black beans, etc. Gas stovetop: If you have a gas stove, you can simply char them right on the burner over the flame with a pair of metal tongs, then keep them warm in a clean, slightly damp kitchen towel. Microwave: Lastly, you can even microwave them a few at a time wrapped in a damp paper towel for 30-60 seconds. Ain’t no shame in that game!